It’s finally the weekend! And not just any weekend, the weekend before Christmas. This week certainly dragged on, but Trevor and I both finished our classes on Wednesday night, work is winding down for the holiday break, and the path to more relaxing times is getting clearer. I have a few things to wrap up this weekend (holiday photo shoots! Christmas shopping! ), but I’m definitely going to be spending some quality downtime with Trevor, and heading home to make cookies with my mom on Sunday. 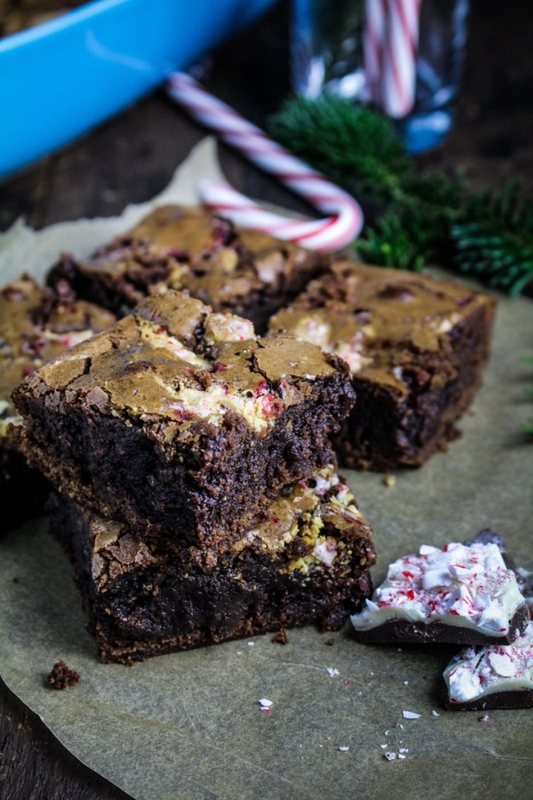 If you’re also planning on breaking out the sugar, butter, and flour this weekend, I have one more recipe for you to add to your lists – peppermint bark brownies. Brownies are perhaps the hardest baked good to make from scratch, at least when it comes to making homemade ones that are as good as the box mix version. Some might argue that when the boxed mixes (especially that amazing Ghiradelli stuff) are so good, there’s no reason to tinker around with from-scratch recipes. And I’d almost agree with you, but there’s something about figuring out how to make a recipe work exactly how I want it to that’s very satisfying. Plus I really enjoy baking – the whisking, the melting, the folding – and I’m much more likely to have the ingredients for brownies in my cupboard than an actual box of brownie mix. 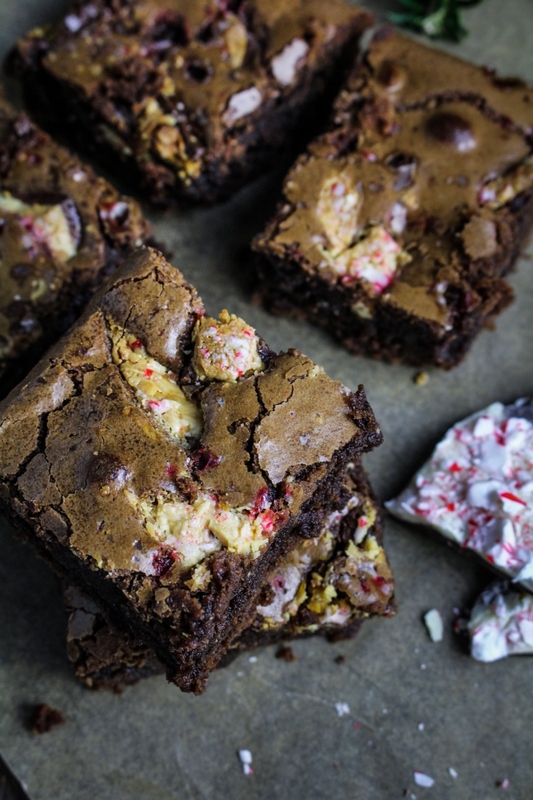 All that said – if you’re a box mix person, make those, stir in peppermint bark at the end, and you’ll be very pleased. For the rest of you, a few notes on this recipe: this recipe makes a very fudgy, thick brownie with a crackly crust. They’re a lot better once they’ve fully cooled – the consistency improves – and the best on the second day. I thought the original was a touch too sweet, so I reduced the sugar slightly, with no adverse effects on the texture. I’ve tried a lot of brownie recipes, and this is definitely one of the best. 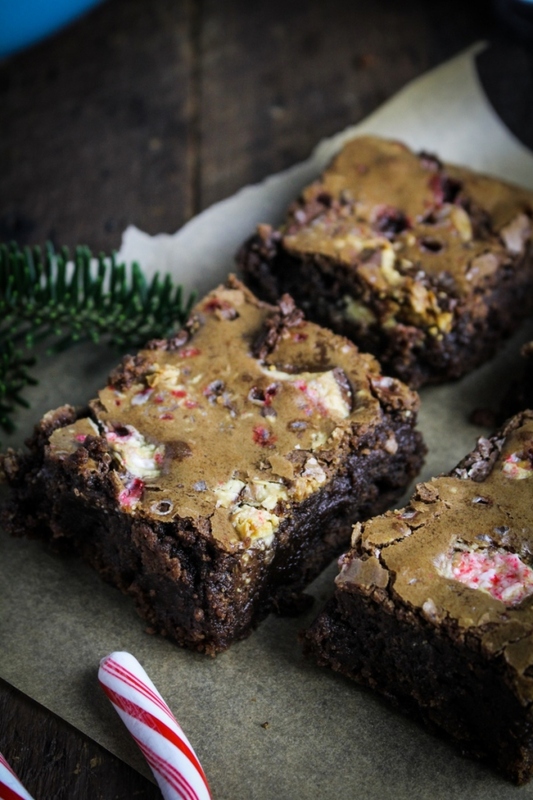 The addition of peppermint bark gives the whole thing a slight mintyness and biting into big chunks of peppermint bark in the middle of a brownie is pretty satisfying. I took most of this batch to a holiday party at my old roommate’s last weekend (perhaps foreseeing my terrible lack of self control during times of stress), but I may have to make another batch this weekend to keep for myself. Brownie recipe adapted from Baking Illustrated via Chew Out Loud. Makes 16. Preheat the oven to 350°F. Line a 9×13 inch baking dish with tin foil, smoothing it out across the bottom and up the sides, then grease the tinfoil (don’t skip this, as the brownies will stick to the foil). Bring a kettle of water to a boil. Sift the cocoa powder into a large, heatproof bowl. Measure the boiling water out (1/2 cup plus 2 TBS) and pour over the cocoa powder, whisking until smooth. Immediately add the chopped chocolate and stir until fully melted. Add the vegetable oil and the melted butter and whisk until thoroughly combined. Add the eggs and egg yolks one at a time, whisking to incorporate between additions. Add the vanilla, then add the sugar and whisk vigorously until thoroughly incorporated. Sift the flour over the top of the chocolate mixture, then sprinkle the salt over the top of the flour. Use a spatula to gently stir until the flour and chocolate is just combined. Stir in 3/4 of the chopped peppermint bark, setting the remaining pieces aside. 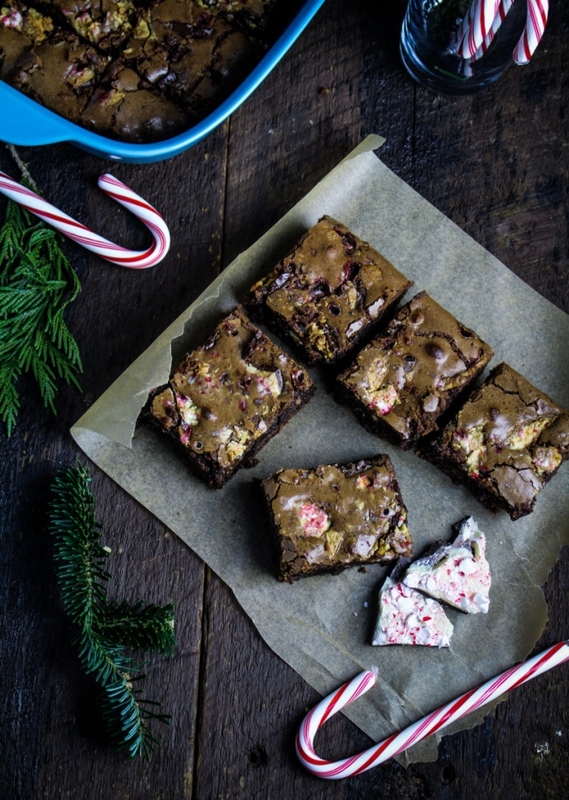 Pour the batter into the prepared pan, then sprinkle the remaining pieces of peppermint bark over the top of the batter. Bake for 40-45 minutes, until a toothpick inserted into the center comes out with a few moist crumbs attached. Remove from the oven and let cool completely, then remove the brownies from the pan by lifting the tinfoil up and out. Cut into squares and serve. Loving the addition of peppermint here, perfect for Christmas… think I still have time to squeeze this recipe into my holiday baking list too!